Download Links Of iOS 8.3 final version for iPhone and iPad are out. Full changelog along with other information is detailed below. It was strongly suspected that OS X 10.10.3 download would arrive with a new Photos app today – and it did – but what we didn’t necessarily foresee was the final release of iOS 8.3. However, after a number of betas, the update is finally ready for the masses, and along with an assortment of new features, Apple has thrown in a boatload of bug fixes and performance enhancements. The emoji system has been expanded upon, as was indicated through the betas, and there are now 300 new icons to help further the conversation. Notably, the people emoji range has been diversified, and if you’re a constant user of these minuscule images, then you’ll love the latest software update. iOS 8.2 was laden with bugs, and as such, iOS 8.3 is all about repairing the damage. The full changelog, which can be seen below, offers a complete look at what’s been amended, but it’s good to see that both Wi-Fi and Safari have been given some attention. iOS 8.2 also prompted a spate of battery-related quibbles when it launched, and there doesn’t appear to be any mention of a remedy here, but with so many tweaks and adjustments, we’d expect a better level of battery retention with iOS 8.3. Siri now supports a variety of new languages, including Danish, Dutch, Portuguese, Russian, Swedish and Thai. The voice assistant has grown considerably in stature and general importance to the iOS ecosystem in recent times what with the upcoming Apple Watch launch, and as well as the increased language support, Siri can also begin calls on speakerphone if you reel off the command. If you’re not a great user of emoji or Siri, then you’re not going to see a lot feature-wise, but the general smoothness and ease-of-operation should pick up thanks to the sheer volume of bug fixes. Since this is hot off the press, we haven’t had a proper chance to check it out as yet, but if we spot anything interesting in getting acquainted with iOS 8.3, we’ll be sure to follow this report up with the details. 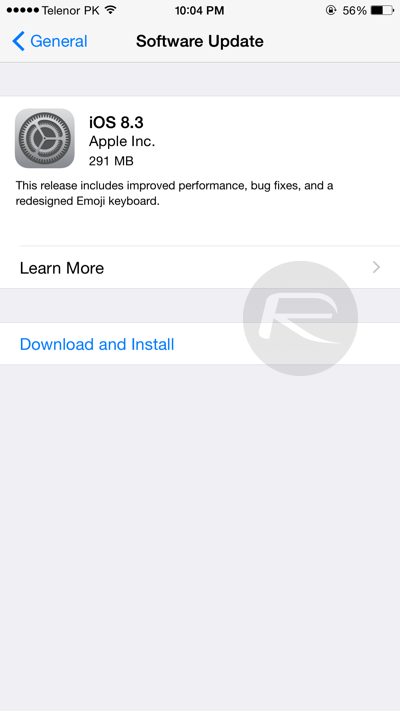 You can download iOS 8.3 OTA via the Software Update feature on your iOS device in Settings > General. You can also update or start fresh by restoring your device to 8.3 using direct download links given below. As ever, it’s free of charge, and compatible with all iPhones, iPads and iPod touches that run iOS 8. 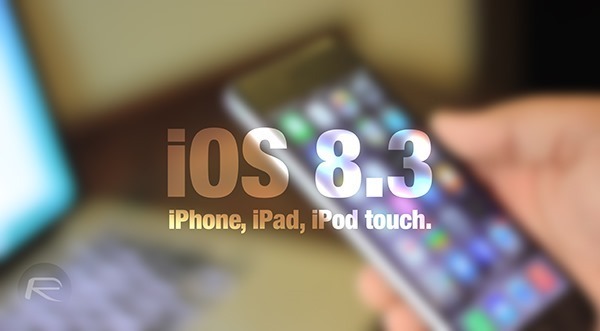 Update x1: Here’s a video showing the most notable new features of iOS 8.3 in action. use software update on iOS device to get it… updated both my iPhone 6+ and iPad Air 2 this way.. If you wish to jailbreak in the future, stay away from OTA updates and always do a fresh install. Then if a jailbreak comes out, you won’t be able to jailbreak. Exactly. I was forced up to 8.2 so I just hopped on the 8.3 beta bandwagon and here I am. Can’t wait till a JB is released for 8.3, then I’ll be right there with you. Sorry you lost your JB. Not sure what evidence leads you to expect better battery retention… almost all previous updates have made battery life worse… Here’s to hoping!! 8.3 has been released already today. I’m in the same boat. Was looking VERY hard at the Pioneer Appradio 4/SPHDA120, as it can be had for under $500. But I’ve heard a lot of users report tons of issues with it on iOS 8 and up, things like the keyboard not working at all and stuff, which is ridiculous… So I’m waiting for it to mature a bit. I’m also an avid Waze user, and I really want Waze in my dash. That’s the #1 reason I want to upgrade. My Pioneer AVIC F90BT is getting quite ancient! Is it safe ? I stayed with 8.1 iPhone 6 plus when I bought it at Verizon last December. still doesn’t fix video buffering bar.. Thanks for releasing these, our network has problems downloading files into iTunes, so this is sometimes the only way I can update devices. one this … after download how to install and any specific directory to put in windows 7 ? Hello, Ive always updated my iphone using itunes however im no living in a location that our internet drops a lot…… i cant update my phone nwow using itunes because the download starts over again…..
Im downloading the IOS 8.3 from your site now. Can you please tell me step by step instructions on how to load the new 8.3 in itunes so I can update my phone? Thank you very much and sorry for the NOOB question….. I need to know the same question, how do I load the new 8.3 using itunes after ive downloaded this? Periodically I check on how iOS 8 is doing after how bad I got burned by ios 7 on my iphone4. I swore, never again will I take a perfectly functioning phone and download an ios that its not designed for. There are nothing but horror stories on apple support page for ios 8.3 on the iphone 5s. My phone works fine the way it is. You can downgrade your iPhone 4 from iOS 7 to iOS 6.1.3, Smooth! See below if you still need an answer for this. Same here.It says that the software is up-to-date,but the software is iOS 7.1.2. Thankyou. I am trying to downgrade from ios9 to ios8.3 (downloaded from here) on my iphone 4S. I keep getting ‘Error 3194’ coming up when I try to do it in Itunes. What do I do?? if i have a icloud lock device an download the new os an transfer to my ipad will it then work ? I got IOS 10 but I want to downgrade for Jailbreak purposes, will this restore my Iphone and delete all data?